Thursday we arrived in Johannesburg in the afternoon and headed into Illovo to check out Wolves Cafe. We ended up eating next door at The Good Luck Club. Both were fantastic, and we got what we were looking for - good food & a bottle of wine. After we filled our bellys, we headed to the Aparteid Museum. A very informative tour of the history of segregation in South Africa. Friday we woke up and headed to Pretoria for some more history lessons. We passed the President's House, walked through the gardens at the Union Buildings, and climbed the stairs at the Voortrekker Monument. Ended our day with more good food & wine at Tribeca. Friday evening we spent in Melville. We started at Cafe Mexicho for some beers & tequila shots (tequila shots with pineapple wedges & tabasco - a brilliant idea from our new friend Cuno). We then strolled around the corner to the Ant Cafe and ended our night off at The Ratz bar. Saturday R arrived and drove us girls down to Newtown. 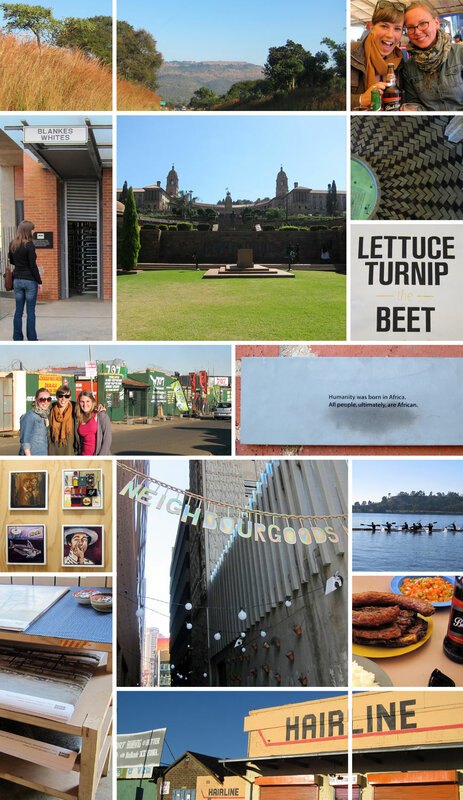 We hit up the Neighbourgoods market, had coffee at Post and visited the CO-OP gallery (all recommendations from our online friend Catherine). We also discovered The Creative Block & The Shoe Shop (more photos of both of these on Chelsea's blog). Sunday we woke up early to watch R compete in the Gauteng Canoe Marathon Championships (he came in first! Congrats R!). Afterwards we headed to Soweto to have a Shisa Nyama at 707 Panyaza. Shisa Nyama, literally meaning "burn the meat" in Zulu, is an informal braai with grilled meat, pap & chakalaka. This was by far one of the coolest things we have done so far, probably because it involves food, beer and eating with our hands. All in all, we soaked in as much as we could the four days we were there. Joburg is an interesting and exciting city. We were lucky enough to have some great friends to drive us around on the massive highways and guide us around when we were driving on our own. We are now back in the Slowveld, enjoying the fresh air and getting ready for our next adventure.